Pompano Park, just north of Fort Lauderdale FL is growing. With a management team laser-focused on handles and treating customers right, the future seems good for the track. In December they had their highest handle evening in over two years and have again upped purses. We spoke to their director of racing and got some answers to why he thinks the little track is building a following. "We have heard for many previous years 'this will be our last season'", says Director of Racing John Yinger. 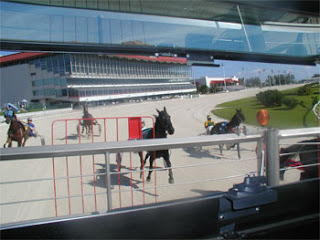 "Now with our purse increase, higher handles, and a proposed new long term deal with horsemen, we are looking to the future"
So goes the storyline at Pompano Park. This change in outlook did not happen by accident. It was a multi-pronged attack to grow handle and grow customer satisfaction. "Our simulcast manager has a casino background and he is also a horseplayer. He has been pushing for churn and better value for horseplayers. We reduced our takeout and expanded our signal reach, so the market is looking at the product." he said. In late 2009 the first step was to attack pricing, where up until that time, Pompano embarked on perhaps the largest one-time takeout cut in horse racing history. WPS dropped from 20.5% to 19%, Pick 4 takeout went from from 25% to 15%, all other bets dropped from 28 to 23, except supers which dropped from 29.5% to 25%. "Instead of being one of the highest takeout tracks out there, we moved to at or below harness racings average. The pick 4, for example, is picking up steam. No one played it at all - we averaged $800 a night historically. Now we average over $4000. We hope to average over $5000 next season." said Yinger. The push has not stopped there. "We have tried to make the racing more fun for on-track patrons. We have a trackside show and we offer five or six starting car rides a night. We have tried to get the younger audience to the track. While they are here and betting they get more churn too. Our on-track handle has doubled a lot of nights." he said. John also told us that over the summer they worked hard to brighten up the track, and the staff - even on the casino side - has been racing driven. "We painted and upgraded several things, on track. Our staff works very hard on both sides to promote racing" he added. With most of the handle - like all tracks - coming from off-track, they have tried their best to maximize the interest by offering free video on the website and free past performance files. Because of a dispute on giving out free data that has been suspended at the present time, but he hopes something can be worked out to get the free programs back on the website. Whereas a lot of tracks score their progress by pure profit and loss, the management team at Pompano is focused on handle and growing the number for the long-term. "I keep a white-board in my office with last years handle numbers listed. Then I add this years and compare year over year numbers. I do not have the overall numbers handy but I can tell you that last night a year ago we did $232,000 in handle. Last night we did $370,000." Lower takeout, a better simulcasting product, a nicer on track experience - and two purse hikes in three months. It seems that it's a win-win at Pompano so far this season. It's one small track that has grown. 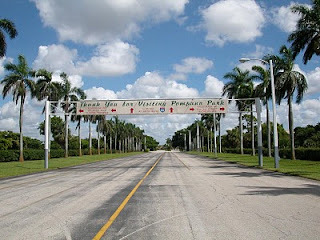 If you'd like to pay this track a visit you can find out more about them at Pompano Park's website. To add your name to HANA's Harness Racing Working Group, please email allan@hanaweb.org to add your name to the list for survey's, feedback and more. It is no surprise at all that a casion exec is behind this success story. They know "tons" more about gaming and customer service than most track operators. Track operators still act like they have a monopoly and the customers have little or no options. Glad to see this in South Florida. I am also glad Tioga Downs started it this past summer. The industry does need a kick in pants once in a while, especially those tracks run in Pennsylvaina. 35 percent for trifectas at Pokie, geez. No wonder their handle has declined. Meadows is no bargain either with the trifecta at 29 or 30 percent. Stay away from the Meadows superfectas as the mutual department apparently has not control on outside the state wagering hubs who offer less than a dollar combinations while you have to be at least 2 $1 combos in Pennsylvania. Why can not they offer the 10 cent supers like the flat racing in PA, it is legal. They prefer to have their customers play a disadvantage. pompano should tell the truth. there was a purse increase of $500 per class which lasted one week and then they mdrop the purses back to the previouse schedule and just the week of February 1 they did give a purse increase. they should be truthful and tell the whole story. That would be my bad. I went off two of the previous press releases and did not know about the bump for a specific period of time for the first one. Dave Schwartz - "A Call to Arms in California"
Harness Working Group Says "Go Tioga"
NHC Champ John Doyle Interview. Player Power. Strange Payout at Delta Downs?